Fallen angels are common in the fixed income world. This world consists of managers of bond funds. Just like investment managers who pick stocks or commodities, they face constraints in their funds. They may be limited to only buying certain maturities or certain qualities. Often, managers will be given constraints on both maturity and credit quality. But, they will still be expected to outperform the competition. And, given the constraints they face that can be a challenging task. Sometimes, when we look at the holdings of the top performing fixed income funds we see that they are holding securities that lie outside of the fund’s constraints. This may be just a small number of holding but the higher yields on the bonds provide a boost that beats the competition. These bonds are usually fallen angels, or companies that once met the restrictive credit standards but are now not eligible for the fund because of credit downgrades. Managers are often allowed to continue holding bonds they owned before the downgrade was announced. Individual investors, at times, have a similar affinity to fallen angels, or stocks that were once trading at significantly higher levels. The crash in oil prices set up a number of stocks like this. The list of companies that were once trading higher prices includes companies operating in all aspects of the sector. Golar LNG Limited (Nasdaq: GLNG) is one example. The long term chart is shown below. The stock is trading at about half of its all time high. Golar is a midstream liquefied natural gas (LNG) company engaged primarily in the transportation, regasification, liquefaction and trading of LNG. The company is engaged in the acquisition, ownership, operation and chartering of LNG carriers and Floating Storage Regasification Unit (FSRUs) through its subsidiaries and affiliates, and the development of LNG projects, such as floating LNGs (FLNGs). Under the Vessel operations segment, the Company operates and charters out LNG carriers and FSRUs on fixed terms to customers. Through the LNG trading segment, the Company provides physical and financial risk management in LNG and gas markets for customers around the world. The FLNG segment includes the costs associated with the conversion of its LNG carrier, the Hilli, to a FLNG. The Company, along with its affiliate, Golar LNG Partners LP, has a combined fleet of approximately 30 vessels. Many investors anchor their value of the stock at the old highs. They may believe it is worth that much because it once traded at that level. This could leave many investors predisposed to buying these stocks whenever good news is announced, as it was in the case of Golar last week. Golar announced that it entered into a Preliminary Agreement and exchanged Heads of Terms (“HoT”) for a Charter Agreement with BP Mauritania Investments Ltd and BP Senegal Investments Ltd in their capacity as block operators. The HoT represents a commitment to translate the key commercial terms into a full agreement and proceed with Front End Engineering Design (FEED) on the provision of an FLNG vessel to support the development of Phase 1A of the Greater Tortue / Ahmeyin field, located offshore Mauritania and Senegal. The Preliminary Agreement creates obligations on Golar to progress FEED work and be ready for a vessel conversion from July 1, 2018 onwards; which would be contingent on Project FID, expected to be completed by the end 2018. The vessel conversion would take place at Keppel Shipyard Ltd (“Keppel”) building on Keppel’s delivery of the FLNG Hilli Episeyo, utilizing Black and Veatch Corporation’s PRICO technology. The Preliminary Agreement also includes an option, but not an obligation, for BP on a second FLNG vessel. This is good news because it indicates that Golar could be growing again, and the market reacted to the news in a favorable way. As with the ownership of any stock, buying GLNG could require a significant amount of capital and exposes the investor to standard risks of owning a stock. For GLNG, the May 18 options allow a trader to gain exposure to the stock. An May 18 $32.50 call option can be bought for about $1.70 and the May 18 $35 call could be sold for about $0.70. This trade would cost $1.00 to open, or $100 since each contract covers 100 shares of stock. For this trade in GLNG the maximum gain is $1.50 ($35 – $32.50 = $2.50; $2.50 – $1.00 = $1.50). This represents $150 per contract since each contract covers 100 shares. That is a potential gain of about 150% based on the amount risked in the trade. 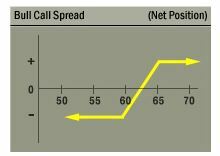 The trade could be closed early if the maximum gain is realized before the options expire.